More and more of you are moving to Windows 10. If you’re like us, and you had “Copy to” and “Move to” on your right-click menu, you’re going to miss having it. So, we think this tip will come in very handy for all of you who are using Windows 10 or who have purchased new computers. We feature this tip about once a year, and now, with so many of you using Windows 10 we thought it was time to bring this handy tip back. We also featured a tip in the newsletter this week about how to make these files yourself. Those of you who once had Windows Vista probably remember that the right-click menu is quite different than it was in previous versions of Windows. One of the features we liked the most, the “Move to” and “Copy to” menu items, are missing from the righ-click menu in Windows 7, Windows 8, Windows 8.1 and Windows 10. If you’ve ever wanted to move a file from, let’s say, Drive C to a folder on a flash drive, you could copy the file or folder or folder and paste it in a different location. Or you could open up two Windows Explorer windows and drag and drop the folder or the file, but this is a lot of unnecessary rigmarole. 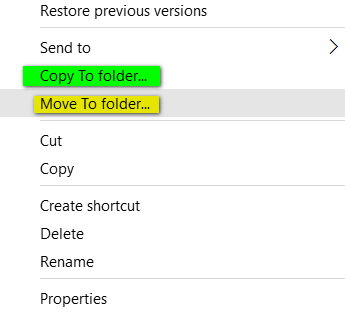 Wouldn’t it just have been easier for the Windows brain trust to have put “Copy to” “Move to” selections on the right-click menu in Windows 7, Windows 8, Windows 8.1 and Windows 10? Indeed it would have been a piece of cake, but strangely, they didn’t. Tried and tested in Windows 7, Windows 8, Windows 8.1 and Windows 10. It works on both 32 bit and 64 bit Windows. Slick! Thanks for this great tip. It worked flawlessly. It is awesome to have “copy to” and move to” back into my context menu. Thanks so much! I added it to my right-click menu! Great! Thank you !! Worked perfectly ! Thank you so much! Worked like a charm. I’m happy to have this feature back again! Worked, thanks so much. You are awesome!